You can use the Xbox One Chatpad to easily send messages to friends, redeem codes, and search apps and the web. Plus, when you attach a headset, you can chat while you play. 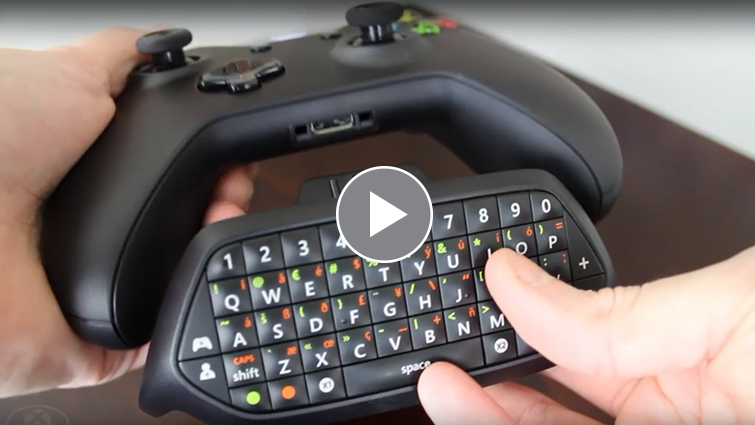 Watch the video "How to set up your new Xbox One Chatpad." Note This video is available in English only. Backlit keyboard - The keyboard lights up whenever a key is pressed. It turns off after a few seconds. Audio controls - Use the +/-, mic mute, and game/chat balance to customize your experience. 3.5-mm audio jack - Mono headsets will send and receive chat audio. Stereo headsets will send and receive both chat and game audio. Compatibility - The chatpad works on both Xbox One and Windows 10, and it attaches to all Xbox One controllers. Update your console to the most recent Xbox One operating system. The chatpad requires your console to have a November 2015 (or later) update. For more information, see Xbox One operating system versions and system updates. Turn on your Xbox One Controller. Insert the chatpad into the controller. Update your Xbox One Controller. The orange LED will blink to indicate that it's connected and requires an update. See Update your Xbox One Controller for more information. Connect a 3.5-mm audio headset cable to the chatpad. For more information, see Connecting a compatible headset to Xbox One. 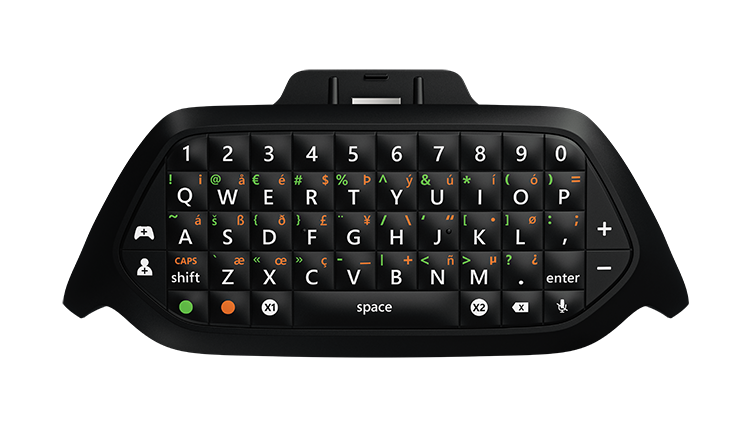 The following image illustrates the special keys and functions of the Xbox One Chatpad. Press the Orange or Green key, followed by any text key. The corresponding character on the key pressed will be typed. The Orange or Green key will be lit while in this mode. Pressing any text key or the Orange or Green key again will exit this mode. If you are in Caps Lock mode, an uppercase character will be displayed. a. Plug your chatpad into the controller. b. Press the Xbox button to open the guide. e. Select Kinect & devices. f. Select Devices & accessories. g. Select the controller the chatpad is connected to. 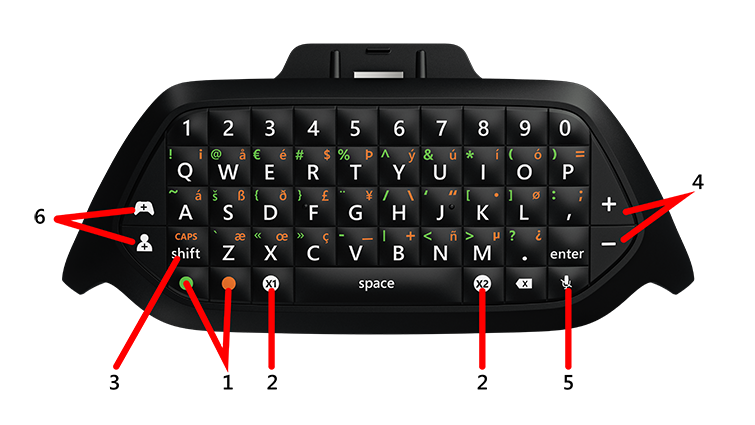 h. Select the desired function for the X1 and X2 keys from the Device options menus. Follow the instructions to set up your TV. These keys do not function when using Windows 10. To enter Caps Lock mode, press the Orange key followed by the Shift key. The Caps LED will be lit when in this mode. To turn off Caps Lock mode, press the Orange key followed by the Shift key. The Caps LED will turn off. Use the +/- keys to increase/decrease the volume. You’ll hear a beep when you reach the maximum volume. To mute your microphone, press the Microphone icon. The LED on this button lights up when muted to indicate that others can’t hear you. These two buttons adjust the mix of game audio versus chat audio. Pressing the controller icon will increase game audio, and pressing the player icon will increase chat audio. A tone will sound when you reach 100-percent chat or game audio. This mode allows extra characters to be typed when you press any of the following keys: ^, ~, ¨, `, ‘. When any of these keys are pressed, the chatpad enters Special Character key mode and types the corresponding characters shown in the following table if you type a, e, i, o, u, or y within two seconds. If you’re having an issue with your Xbox One Chatpad, try the following solutions to resolve the problem. Check that the controller is turned on and functioning properly. See Xbox One Wireless Controller functions improperly for help with your controller. If you turn on your controller and the keyboard still doesn't work, try the next solution. If the keyboard still doesn't work, try the next solution. Under DEVICE OPTIONS, select Update. Follow the instructions to complete the update. Select Settings, Power & startup, and then the Restart Now button to shut down and restart your Xbox One console. Check that the controller is turned on and functioning properly. See Xbox One Wireless Controller functions improperly for help with your controller. If the controller is on and still has poor or no audio, try the next solution. If you reconnect the headset to the Chatpad and the audio still isn't working, see Connecting a compatible headset to Xbox One to make sure your headset is compatible. If your headset is compatible, try the next solution. Following the instructions to complete the update. Note The chatpad keyboard does not work with Xbox One backward-compatible games. Make sure that your console and chatpad language match and that you are in a supported country (see Supported countries, below). Your chatpad serial number ends with the letter B, E, F, G, or S to indicate which language it supports—British-English, US-English, French, German, or Spanish. If the wrong characters still appear, try the next solution. You may be entering Special Character key mode if you are pressing one of the ^, ~, ¨, `, or ‘ keys followed by a, e, i, o, u, or y. See the Special Character key mode section to understand this functionality. If the previous solutions didn't work, we recommend trying the Xbox Forums to see if a member of our community can help you. If none of the solutions on this page resolved the issue, you may have to go to the Xbox Online Service Center to have your device replaced. 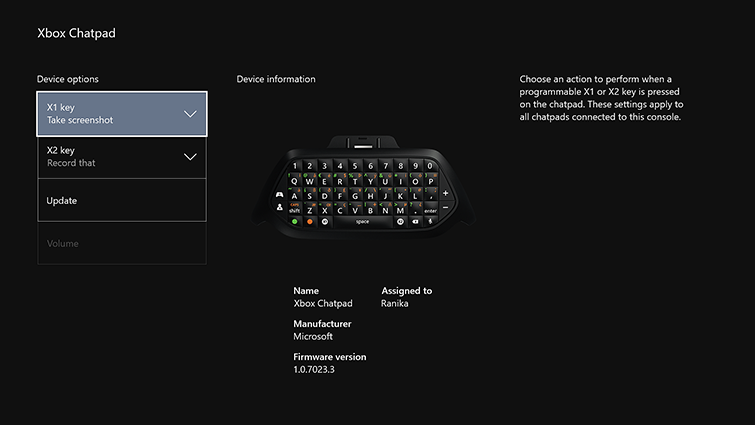 The Xbox One Chatpad is available in the following counties and regions: Argentina, Australia, Austria, Canada, Chile, Colombia, Czech Republic, France, Germany, Greece, Hong Kong, Hungary, India, Ireland, Israel, Mexico, Netherlands, New Zealand, Saudi Arabia, Singapore, Slovakia, South Africa, Taiwan, the United Arab Emirates, the United Kingdom, and the United States. Would you like to contact Support regarding the "All about the Xbox One Chatpad" issue you were reading about or a different issue?